With over 250 financial firms relying on our services. A turnkey web-based clock, providing automatic time synchronization for validated time. Maintain quality of service and remain knowledgable in the industry. We stick to this concept and carry it into everything we do. At Central Time Clock, you can expect to have your call answered by a human being, and not a recorded voice. As a family owned company, we know the importance of building and maintaining healthy relationships, which is why Central Time Clock has earned the reputation of a reliable, knowledgeable, and professional organization. We help effectively manage your employees and control labor costs. 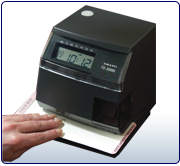 Consider Central Time Clock as your expert shopper. We have seen hundreds of clock models over the last 80 years and have eliminated all low quality machines. Our business is about quality, which is why we offer a focused product line guaranteed to accomodate businesses of all sizes.